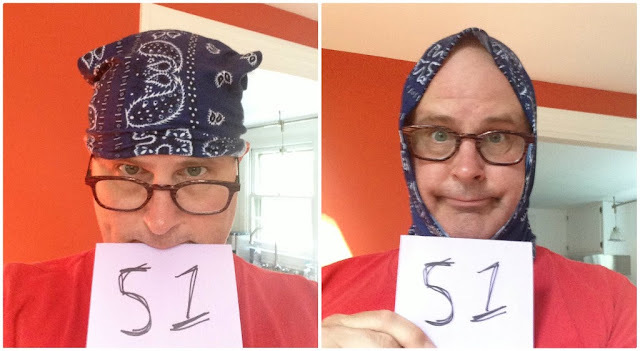 Day Fifty-One / Hat Fifty-One: 100% polyester blue bandana print Buff brand multifunctional headwear. If this conjures memories of the pink paisley do-rag from entry 41 and has you crying "duplicative," I will point out to you that this isn't the same animal -- in fact, according to the packaging it's twelve different animals -- as in it can be worn 12 different ways. By way of illustration, the photo on the right is alternative #4 (hood). The Bride seems to like this one (in alternative #7 "do-rag" mode), sometimes saying it gives me a Bruce Weber vibe (the famed photographer often wears one), other times saying it makes her think that's the way I looked back in my UVM days. PC 8: Captain Kangol Who?